To make the garlic-harissa marinade, in a food processor, blend the chopped garlic, harissa paste, nutmeg, sumac, thyme, lime juice and olive oil. Pat the chicken drumsticks dry and season lightly with salt and pepper. 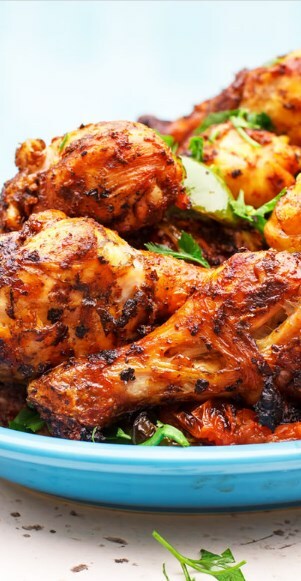 Now apply the garlic-harissa marinade to the chicken drumsticks, particularly underneath the skin. Do not discard the remaining marinade. Place the chicken drumsticks with the sliced onions in a large jumbo kitchen bag with a seal. Pour the extra marinade on top. Seal the bag shut and massage the contents so that the chicken is well covered in the garlic-harissa marinade. When ready, heat an outdoor grill to medium. Grill the drumsticks on medium heat, covered, for 35-40 minutes or until well done. As they grill, turn the drumsticks every 7-8 minutes. Serve with an easy mezze platter like this one. Or sides like fattoush salad; kidney bean and cilantro salad; roasted red pepper hummus. If you choose to substitute Harissa with a different chili paste, select one that does not have sweet undertones. You want to go spicy-tangy for this recipe. And of course, if you prefer a less spicy drumstick, go ahead and reduce the amount of Harissa or chili paste to your taste. Recommended for this Recipe our Private Reserve extra virgin olive oil, and all-natural ground nutmeg, and sumac spice. SAVE! Create your own 3-pack or 6-pack of our all-natural or organic spices! Or try our Ultimate Mediterranean Spice Bundle!